The bumpy transition from adolescence to adulthood is perhaps the most important defining experience of a person’s life: those first solo steps beyond familial comfort and familiarity, and the slow learning to discover both one’s self and one’s position in the world, seldom a smooth, comfortable or necessarily swift transformation. 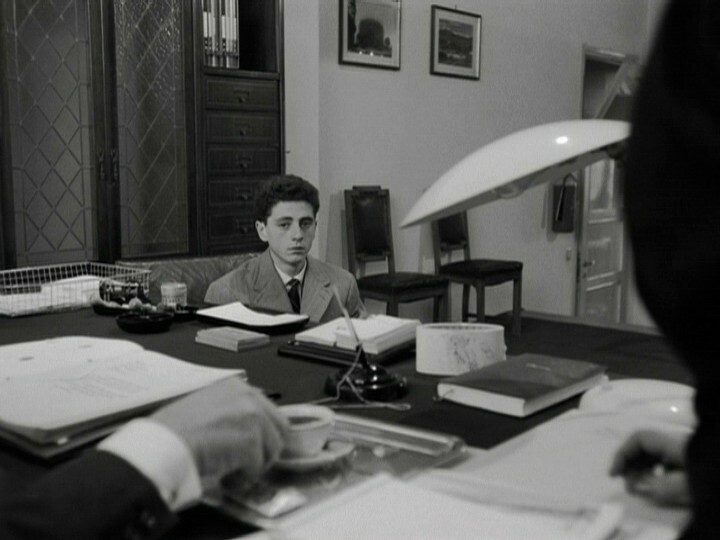 Coming of age is well-worn cinematic material, but documented nowhere more compassionately as in Ermanno Olmi’s elegant Il Posto, his tender, semi-autobiographical tale of one young man’s emergence into the grown-up world. But look beneath its avuncular, sympathetic surface and one finds a harshly critical denouncement of the modern workplace and the alienating effect it has on its occupants. The setting is Milan, which an opening placard informs us is a magnet for workers migrating from the surrounding countryside. One such hopeful is Domenico, fresh out of school and now being somewhat unwillingly guided by his parents towards a career in the big city. Once there, he is subject to scrutiny via a series of comical arbitrary mental and physical tests, though much of the time seems to be spent waiting with other, mostly older and bigger, candidates in waiting rooms. One fellow inductee, the pretty Antonietta, catches our young protagonist’s eye, and the two share a happy afternoon together acting the grown-ups in the city’s streets and coffee houses – perhaps all is not doom and gloom for Domenico in his new surrounds after all? On a basic level, the story is a warm and largely comical look at this young man’s unease at entering into a very adult world. At the centre of everything is Domenico, played with real pathos by Sandro Panseri: in the neorealist tradition a non-professional actor, but chosen because he was someone who both looked and lived the role. There is every chance that a trained actor may have been too forced in trying to convey the nervousness and hesitancy of the young protagonist, but Panseri makes it look effortless: so many times in the course of the film we see the sweet innocence of his face, more frequently than not trying to hide his nervousness, and cannot help but want to give him a big hug and some encouragement. The humanity of this central performance is magnified when juxtaposed against his cold, sterile surrounds: deep focus camerawork insistently capturing endless corridors and oblique, imposing architecture. As with Olmi’s next film, I Fidanzati (1963), the context is Italy’s postwar economic miracle; the later film exiles its protagonist to the geographical and culturally opposite end of the country, but while the physical displacement in Il Posto is by comparison over a much smaller distance, it is just as unfamiliar an environment for little Domenico. As the film’s opening scenes make clear, he hails from a poor, rural background, and his juxtaposition to the urban jungle becomes symbolic of his country’s economic transition into a modernity. But there is more: as Millicent Marcus argues, Olmi’s film portrays Domenico’s entry into a world of consumerist luxury and social mobility, as unthinkable to his father as it would be to protagonists of neorealist films but a decade and a half earlier. If Olmi is giving us a vision of the future, though, it is not a flattering one. Anticipating Terry Gilliam’s Brazil (1985), the film offers a warning of the dehumanizing nature of large-scale bureaucracy. In one scene we are introduced to a rather comical office environment, populated by a variety of eccentric characters with odd tics: one man methodically combs his sideburns, another struggles with a malfunctioning lamp, all the while one employee continues to repeatedly throw balls of paper at another across the office. This all appears to be being played for laughs, until we are given a series shots illustrating the lives of these men outside of work – an aspiring opera singer, a would-be novelist – and realise that their strange habits are actually the result of the workplace’s stifling of their individual personalities. Whilst not as bleak as, say, Akira Kurosawa’s Ikiru (1952), it is nevertheless a damning view of the modern-day work environment. Another cinematic reference point may well be Billy Wilder’s The Apartment (1960), released a year earlier than Il Posto, and with a similarly cynical view of the bureaucratic machine (coincidentally, both films climax on New Year’s Eve). In Wilder’s film, the absurd object of the office workers’ desires is to move to a higher floor of the building, apparently bringing with it a greater social status; in Il Posto, the hierarchy is represented rather less glamorously – the acquisition of a desk closer to the front of the room; after the death of an elderly employee creates a vacancy at one of the frontmost desks, those sat behind it eagerly shuffle to the one in front of theirs’, a clearly metaphorical step closer to their own deaths. One hopes that Domenico is able to do what C.C. Baxter does and become a mensch, but as the film ends with the repetitive cyclical sound of machinery it is hard to be optimistic this will happen. Despite what is its bleak outlook, the film is by no means depressing; as previously emphasized, Olmi invests the story with warmth and gentle humour, enough that the casual viewer might not focus on its darker undertones. The lack of narrative resolution curiously leaves both an air of hope as well as melancholy, and reflects the film’s resonance: this is not the melodramatics of bicycle thieves or Umberto Ds, but an everyday tale of small triumphs and disappointments in a largely indifferent world; whether or not we take comfort from this is ultimately up to us.